How many curios and memories have you got hidden away in dark drawers and cupboards? 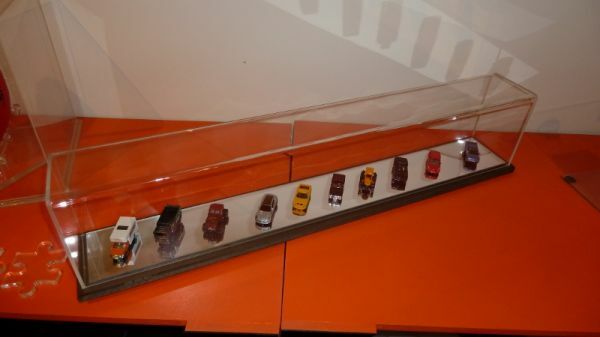 Put them on show with stylish display cases from Plasweld. 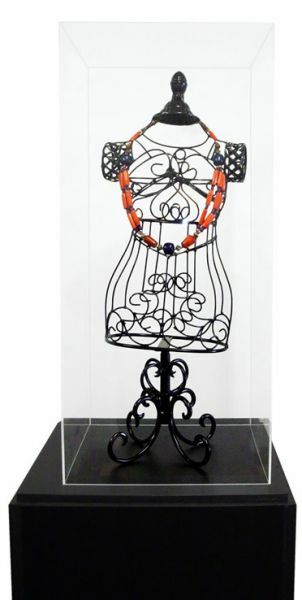 Hand crafted from cast acrylic and set on a base of machined plastic board or timber our display cases make a stylish addition to any home or office. 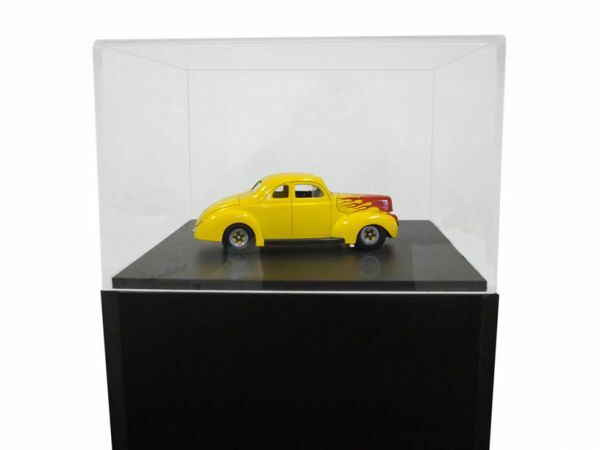 Whether it’s for your prized footy, classic car collection or that priceless set of pearls a Plasweld display case will keep it free from dust and looking good for years to come. So here’s what you need to know about our displays. Firstly, we make all of our displays to order. This means that you can have a lot of input into how the finished unit will look. Details like how much overhang you would like the base to have or whether the base has a square, rounded or chamfered edge for example. Secondly, we give you a choice of materials for the base. Either economy unpainted MDF, premium grade timber or two tone acrylic. And importantly, except for the very small and very large displays, we make them all from high quality 4.5mm thick acrylic sheet. 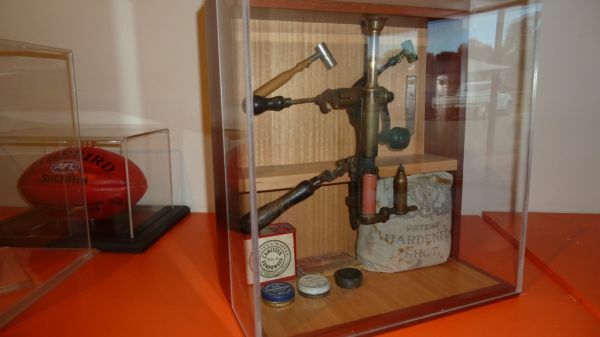 Now this is a more little more heavy duty than most fabricators would use however we like our displays to be well finished and robust so that you can enjoy them for years to come. And yes, we know that you can probably buy cheap displays, brought in from overseas by the container load and possibly even in a size that you suits your needs however when you want a display of a certain size and shape that looks good there is really only one choice. Think Plastic Displays, Think Plasweld. Wanted to send a big thanks for your work. I finally got to see the box and it looks smick. It definitely fits the bill in terms of stability and low in weight. We make displays to order. All shapes and sizes and perfect for that match winning footy. Display cases. They bring your toys to life! This footy display is all clear so as not to detract from the football inside. It has a clear acrylic cradle allowing it to be displayed in the upright position. The yellow Sherrin constrasts nicely with the black base. 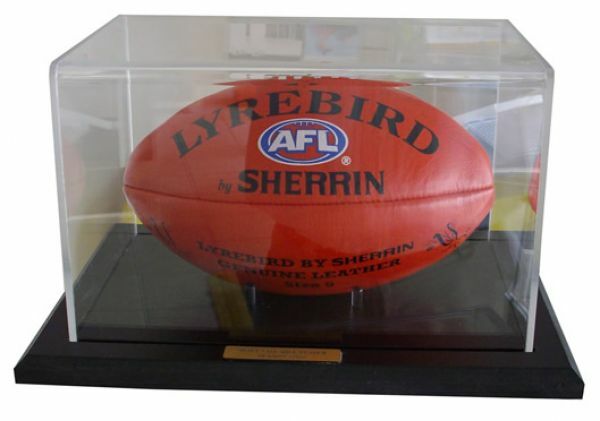 Even in AFL made Victoria we still (occassionally) get asked to display a soccer ball. This lovely old ammunition freeloader was a special family keepsake that just had to be protected. It is now safely housed behind a custom made Perspex cover.